Satisfying spy thriller that was reminiscent of the 1968 film BULLITT because of its doppelganger/doublecross plot (a man pretending to be someone important before being murdered). The lovely Carol Royle had a similar part to what she played in Stirring Of Dust, Doyle started off working undercover as a journalist and Bodie had some key scenes, especially when he used elements of menace to interrogate Batak's daughter Anna. As ever, there were some great action sequences such as the attempt on the fake Batak's life, Doyle's fight near the church and the hair-raising climax. TV TIMES bits from Saturday 17th November 1979. 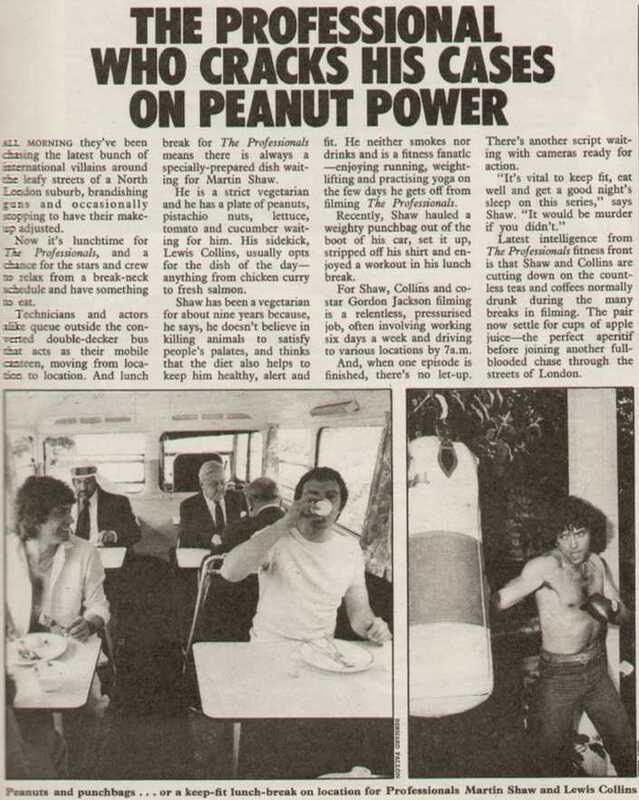 I like that bottom article, it's hard to imagine Bodie & Doyle taking a break to have egg, beans and chips in the back of a van. Martin seems yo have a smile on his face in that one so it can't have been all bad. This is a pretty good episode I think, albeit a little slow to get going. Everytime I see it, it is wait and see till right up to its conclusion - Bodie a great shot in the final scenes I must say. As for 62 - clearly not our Murph and in this as an extra only. Also, the CI5 interrogation centre looks a right dive. The raids on the houses at the end were very reminiscent of The Sweeney for me, especially the three motors all jumped in as they head off to the final destination. I was pretty disappointed to see Bodie hit over the head in this one but overall very good stuff with limited action for the first third. I wasn't keen on this when I saw it on Granada minus in 1997 but I now think it's a good episode. Maybe they were overdoing the espionage stories at this point. Carol Royle is fantastic here as you wonder about her role in her "Father's" death. Good pre title sequence too. A fine, entertaining episode with good plot twists and action scenes. The Pre-credits scene is well done. OK but a bit too similar to Stirring Of Dust with Carol Royle playing the daughter of a spy again. I prefer Stirring Of Dust. Dead Reckoning has some dynamite action scenes to keep it lively. if you keep on ! " The two guys tailing Bodie & Doyle & Anna , certainly chose an ideal car for the job - a brown Austin Maxi !! !